The AFP VI 2018 Scholarship Applications Are Now Open! Were you hoping to travel to the 2019 AFP International Conference (March 31-April 2, 2019) in San Antonio, TX? Apply for the Chamberlain Scholarship and John Saunders Scholarship! These scholarships are open to AFP VI members who have yet to attend an AFP International Conference. AFP VI also has a scholarship available for the Fundamentals of Fundraising Course taking place in 2019, as well as Professional Development Scholarships to fund the educational opportunities that you feel will benefit you the most. For young fundraisers, AFP VI is offering two scholarships for free year-long memberships with AFP! If you know someone just starting their career in fundraising, please encourage them to apply for the Young Professional Membership Scholarships. Please send your completed scholarship or membership scholarship application form to Liz Ausio, Scholarships Co-Chair, at scholarships.afpvi@gmail.com. The deadline is September 17, 2018. Chamberlain Scholarship: One scholarship of a registration fee towards the AFP International Conference. John Saunders Scholarship: One scholarship to be given to the successful Chamberlin Scholarship recipient to cover costs associated with attendance at the AFP International Conference. AFP Vancouver Island – Fundamentals of Fundraising Scholarship (Even Years) or CFRE Review Course Scholarship (Odd Years): Every year, one scholarship will be awarded to cover the registration fee related to participation in either the Fundamentals of Fundraising Course or the CFRE Review Course. Only one course will be offered each year. AFP Vancouver Island – Professional Development Scholarships: With the support of the AFP Foundation for Philanthropy – Canada, up to ten scholarships are available ranging in value from a minimum of $100 to the maximum of $500 based on the applicant’s requested amount and what activities they will be participating in. These scholarships are available to members for professional skills advancement and can include opportunities such as: fundraising courses or conferences; CFRE application fees; the purchase of CFRE reading materials; or assistance with membership fees. 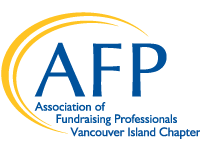 Young Professional Membership Scholarships: The AFP Vancouver Island Chapter is pleased to support fundraisers new to the profession with an opportunity to receive a free year-long membership. The chapter is offering two Young Professional Membership Scholarships for Fundraisers working on Vancouver Island.